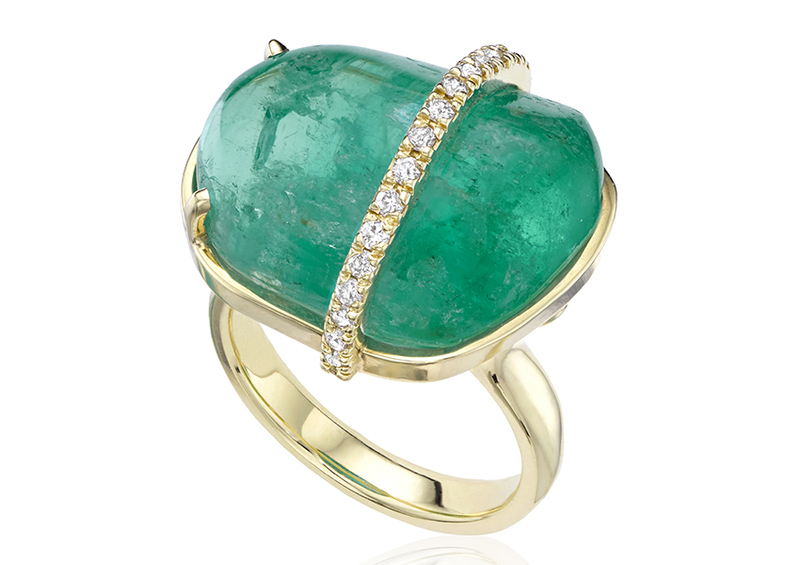 In one of the most spectacular collection launches of the year, Colombian emerald miner Muzo has collaborated with 24 contemporary jewellery designers to showcase the beauty of unfaceted emeralds. 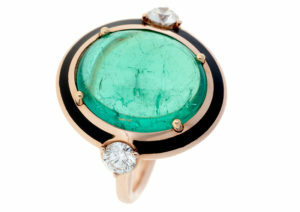 Each designer taking part in the project, which has produced nearly 100 new pieces of jewellery, was asked to design jewels around ethically mined Muzo emeralds. 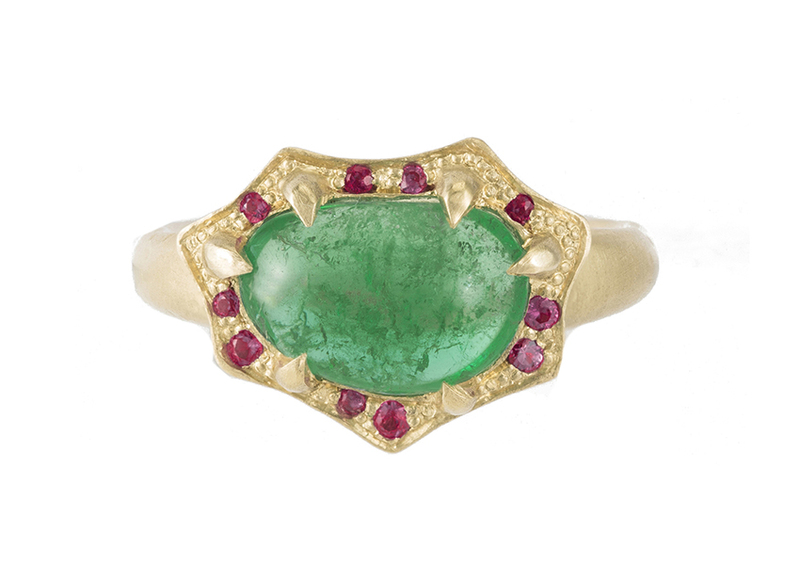 Rather than using faceted gems, designers were challenged to use more unusual variations, such as raw organic slices, tripaches, tumbles and cabochons. 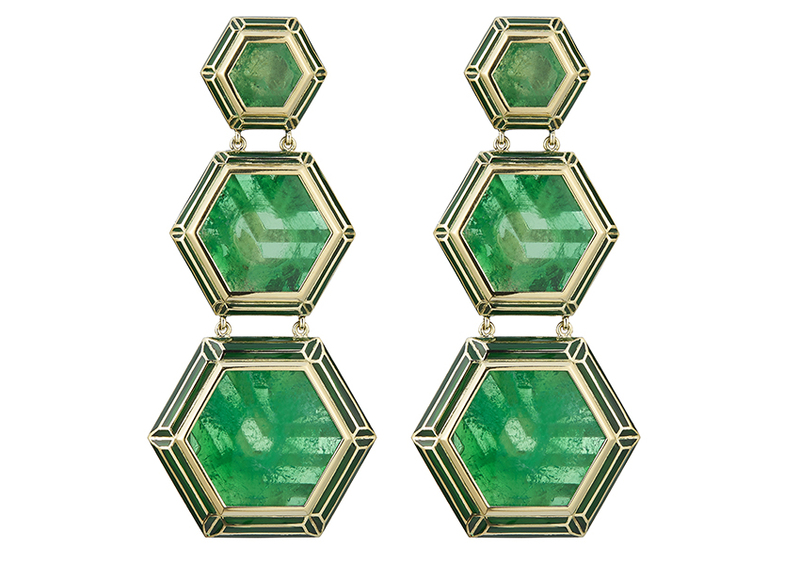 The collection, which made its debut this month at New York ‘s Five One Five, a new luxury condominium building in the heart of West Chelsea that has been designed by Singaporean architect Soo K. Chan. The Muzo emerald jewels, which start from $2,000 (£1,500), are being sold through the individual designers (full listing below). 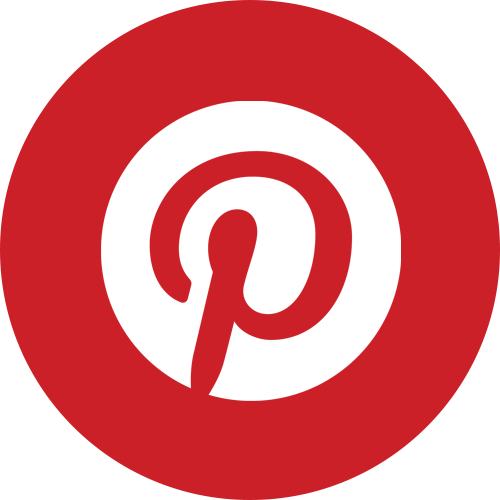 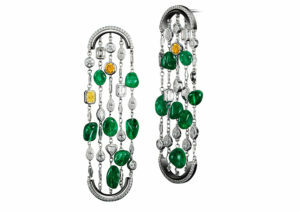 Some pieces will also be carried by stores including Bergdorf Goodman, Saks Fifth Avenue and Moda Operandi. 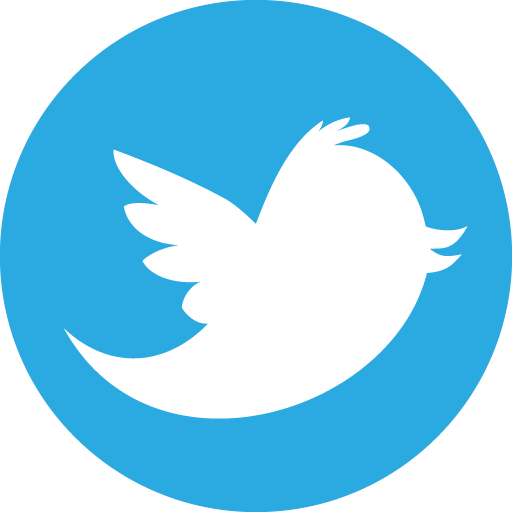 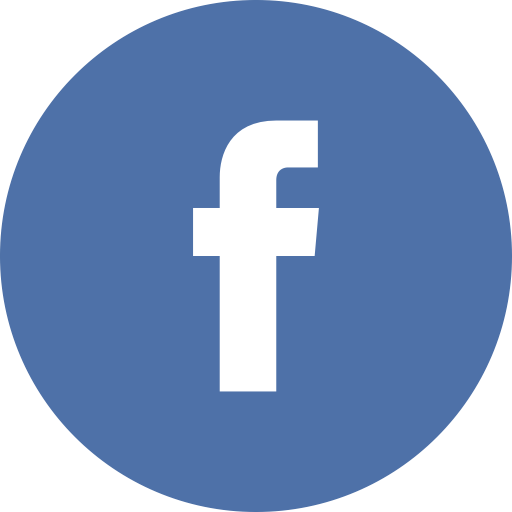 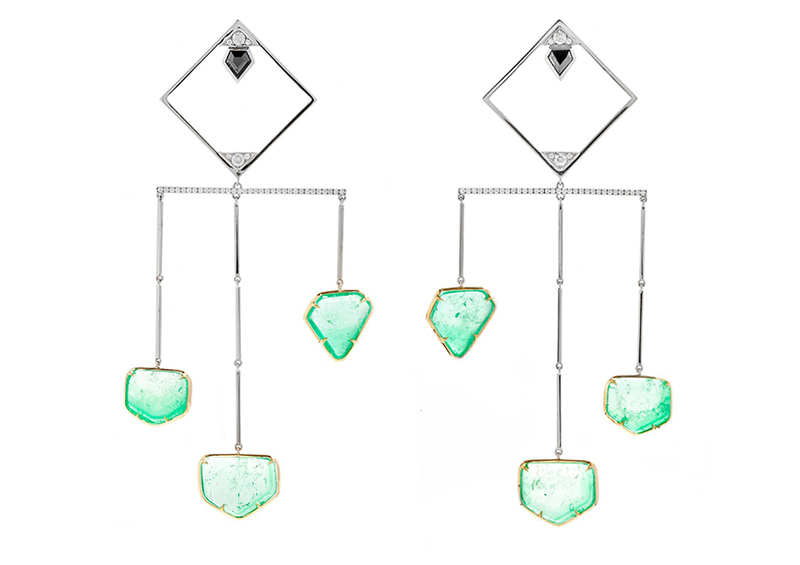 The jewellery designers taking part in the Muzo emerald project are: Alexandra Mor, Alice Cicolini, Ara Vartanian, Coomi, Dana Bronfman, Daniela Villegas, Daria De Koning, Eden Presley, Erica Courtney, House of Meraki, Lisa Kim, Katherine Jetter, Kimberly McDonald, Makal, Mercedes Salazar, M. Spalten, Noor Fares, Sandra Dixon, Selim Mouzannar, Spencer Fine Jewelry, The Rock Hound, Venyx, Victor Velyan and Wilfredo Rosado. 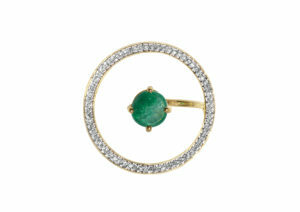 Scroll down for The Jewellery Cut’s edit of our favourite pieces from the collection. 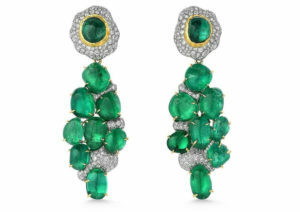 One-of-a-kind platinum and 18ct white gold earrings set with 19.15 carats of tumbled Muzo emerald beads and a mixture of round brilliant, emerald-, oval-, marquise-, heart- and radiant-cut diamonds. 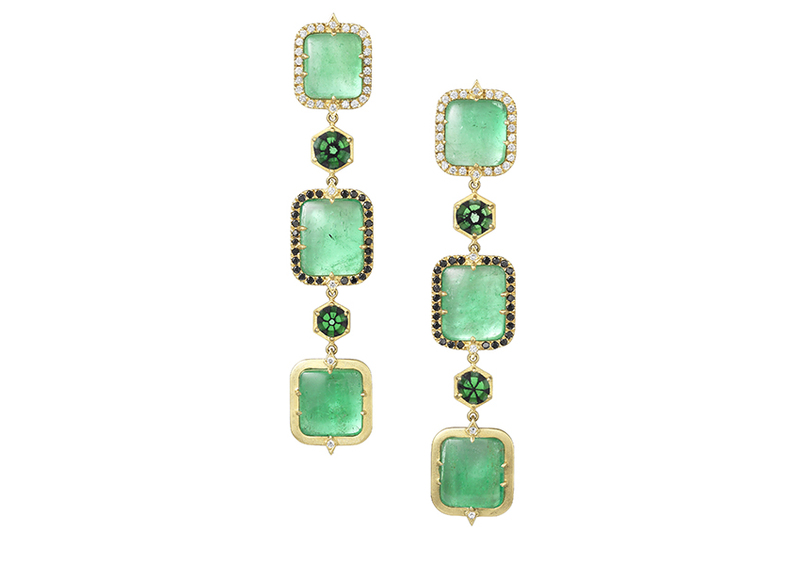 Jaipur Bouganvillea earrings in 18ct yellow gold, decorated with lacquer enamel and set with 55.56 carats of Muzo trapiche emeralds. 18ct white and yellow gold earrings set with 35.18 carats of Muzo emerald slices, 0.62 carats of black diamonds and 0.70 carats of white diamonds. 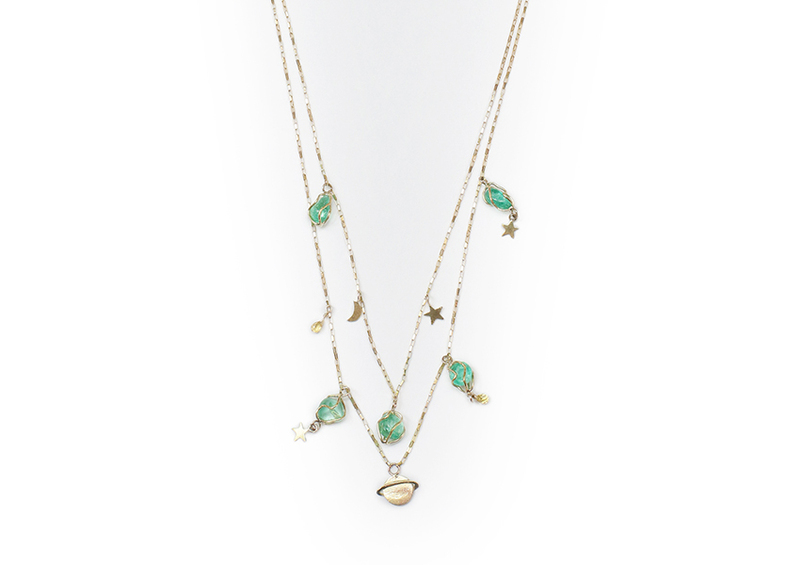 Sunburst necklace in 20ct yellow gold, set with 41.29 carats of Muzo emeralds and 7.71 carats of diamonds. Agra pendant in 18ct Fairmined yellow gold, set with 4.98 carats of Muzo emeralds, 0.78 carats of rose-cut natural black diamonds and 0.09 carats of VVS diamond melee. 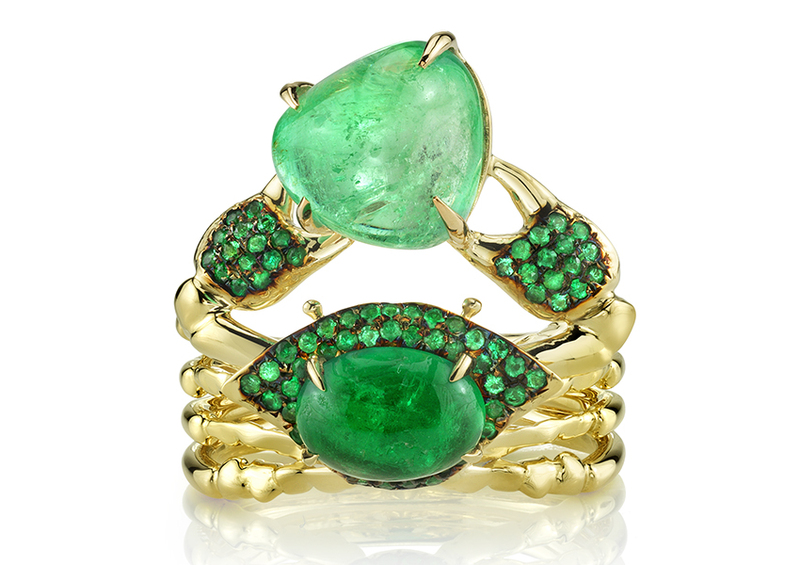 Trapiche Crab ring in 18ct yellow gold, set with 6.39 carats of Muzo emeralds. Flirt earrings in 18ct yellow gold, set with 16.47 carats of Muzo emeralds and Muzo emerald trillion cabochons and 7.37 carats of black opal. 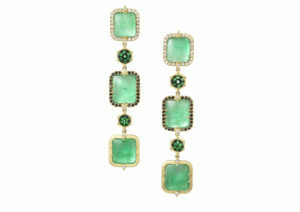 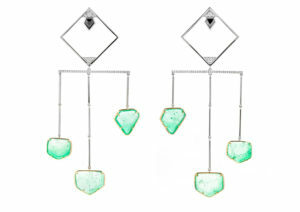 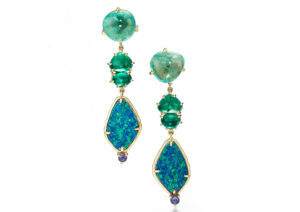 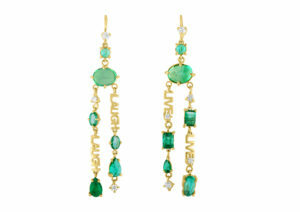 Live/Laugh earrings in 18ct yellow gold, set with 9.6 carats of Muzo emeralds and 0.46 carats of diamonds. 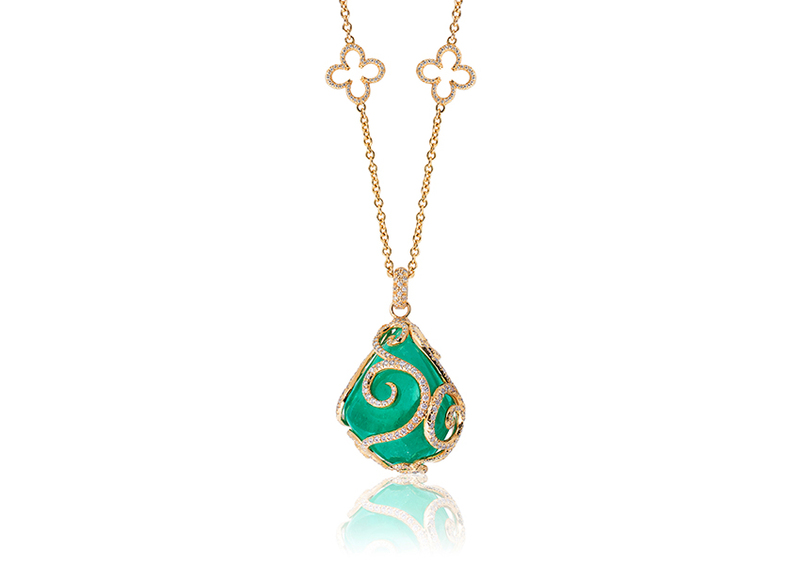 18ct yellow gold pendant with a tumbled 105.99 carat Muzo emerald encased in gold swirls set with 2.78 carats of diamonds. 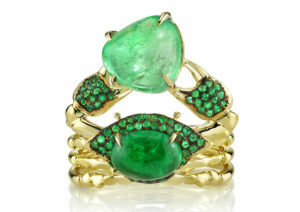 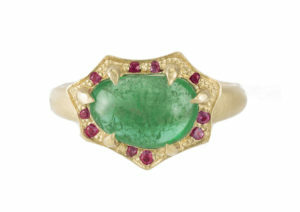 Isabel ring in 18ct yellow gold, set with a 2.25 carat tumbled Muzo emerald and 0.44 carats of diamonds. 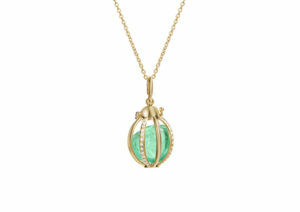 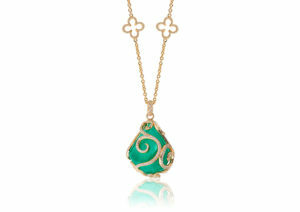 Cage pendant in 18ct yellow gold, set with 0.25 carats of diamonds, with a tumbled Muzo emerald trapped within. 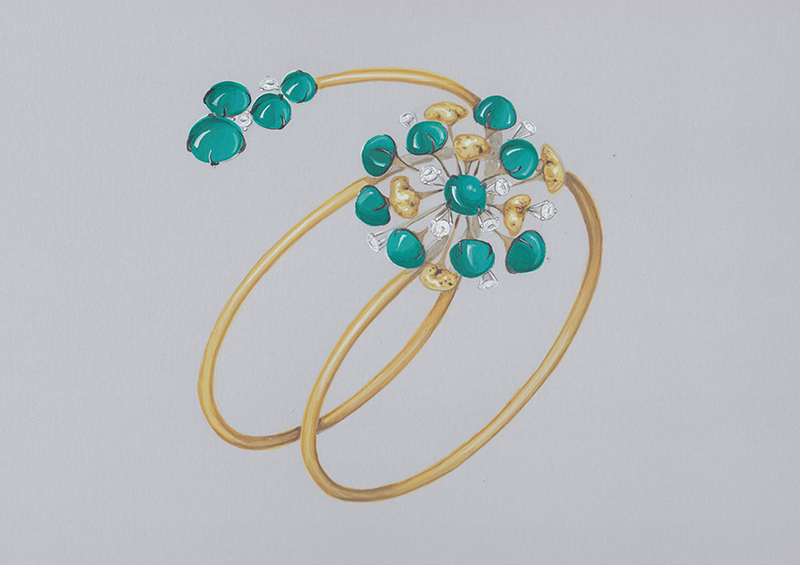 Fairtrade 18ct yellow gold bracelet, set with 15 Muzo emeralds, seven natural gold nuggets and 14 ethically sourced diamonds that have been certified by the Responsible Jewellery Council. 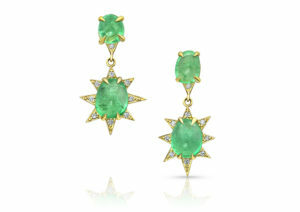 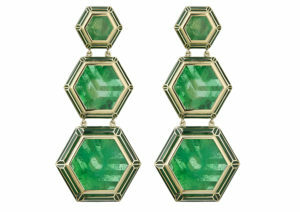 Starburst earrings in 18ct yellow gold, set with 8.01 carats of Muzo emeralds and 0.27 carats of diamonds. 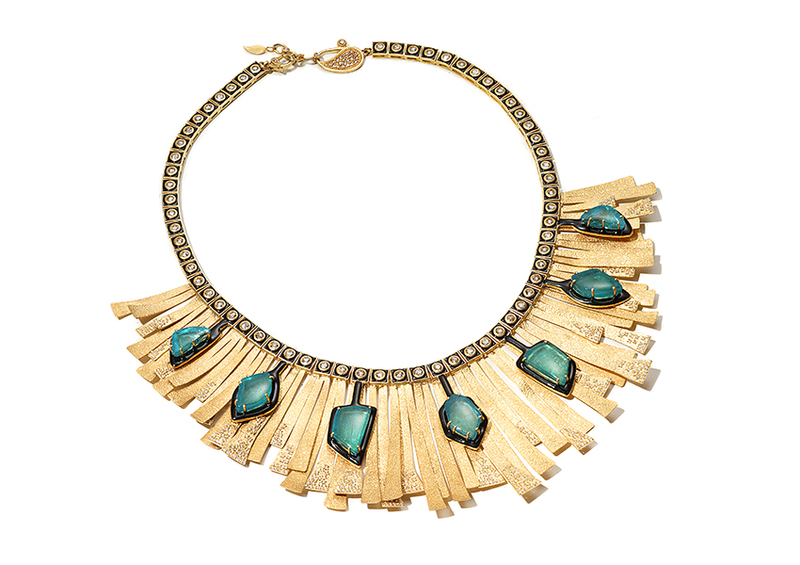 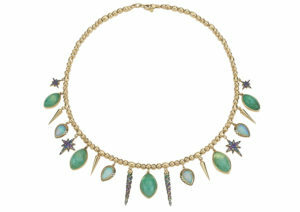 Saturno’s Calling necklace in 18ct yellow gold, set with 5.9 carats of Muzo emeralds and 0.32 carats of yellow sapphires. 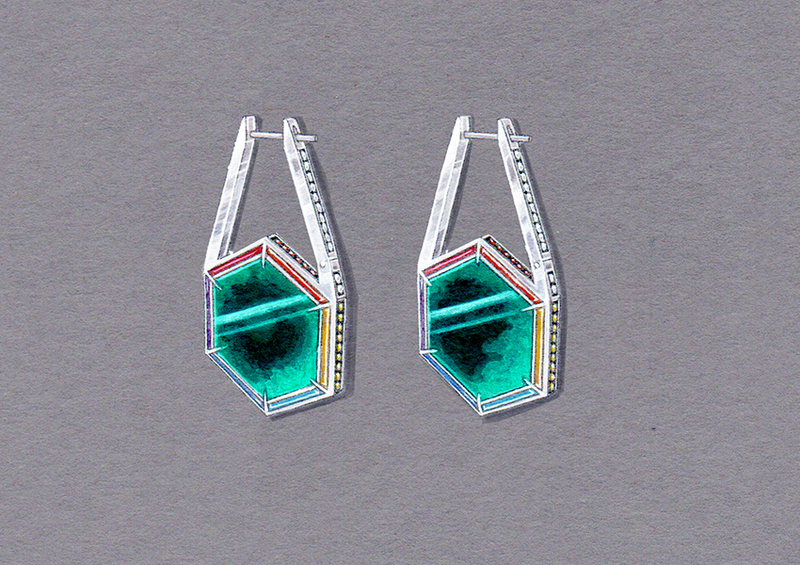 Anahata Trapiche earrings in 18ct grey gold, set with 24.93 carats of Muzo emeralds, 0.43 carats of white diamonds, 0.7 carats of coloured pavé sapphires, 0.17 carats of amethysts, and an inlay of red agate, carnelian, tiger’s eye, turquoise, lapis lazuli and surgelite. 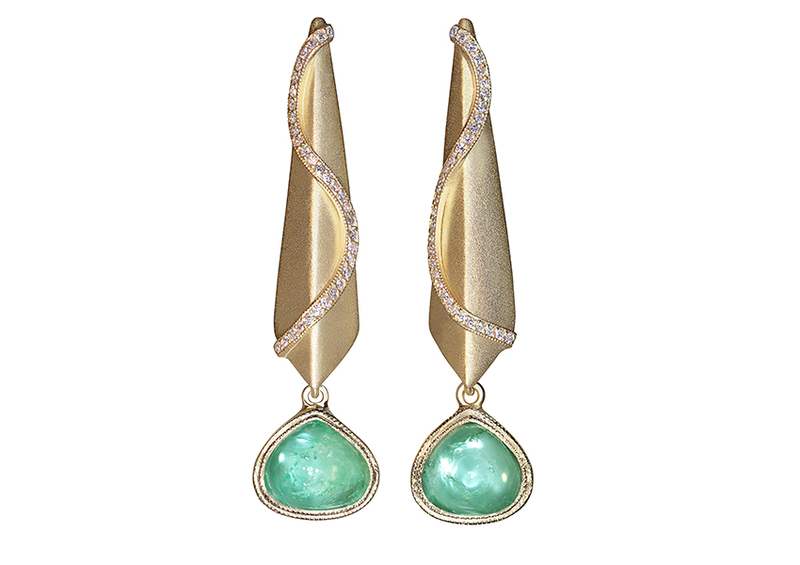 Serpent Goddess earrings in 18ct yellow gold, set with 5.19 carats of shield-cut Muzo emeralds and 0.32 carats of diamonds. 18ct rose gold ring decorated with black enamel, and set with a 7.75 carat Muzo emerald and 0.48 carats of diamonds. 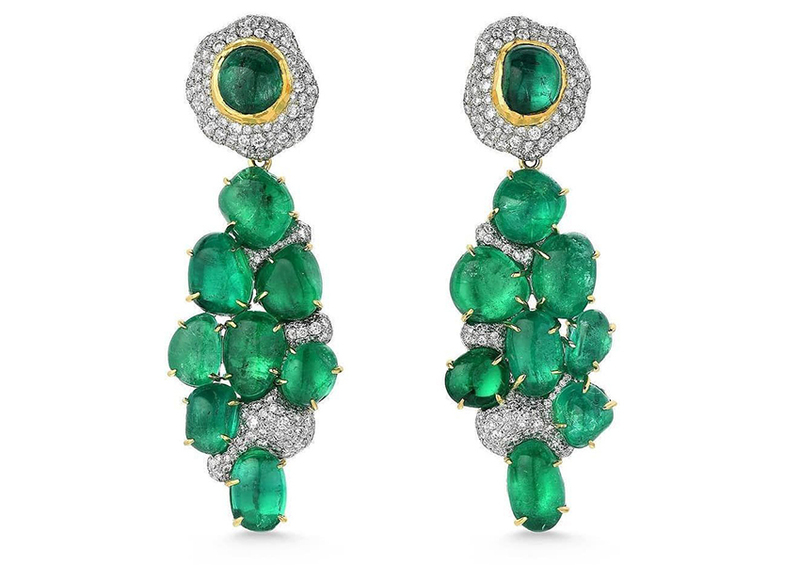 Convertible portrait earrings (can be worn three ways) in 18ct yellow gold, set with 31.32 carats of Muzo cabochon emeralds, 2.02 carats of Muzo trapiche emeralds, 0.85 carats of white diamonds and 0.73 carats of black diamonds. 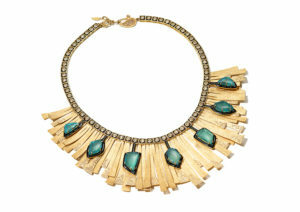 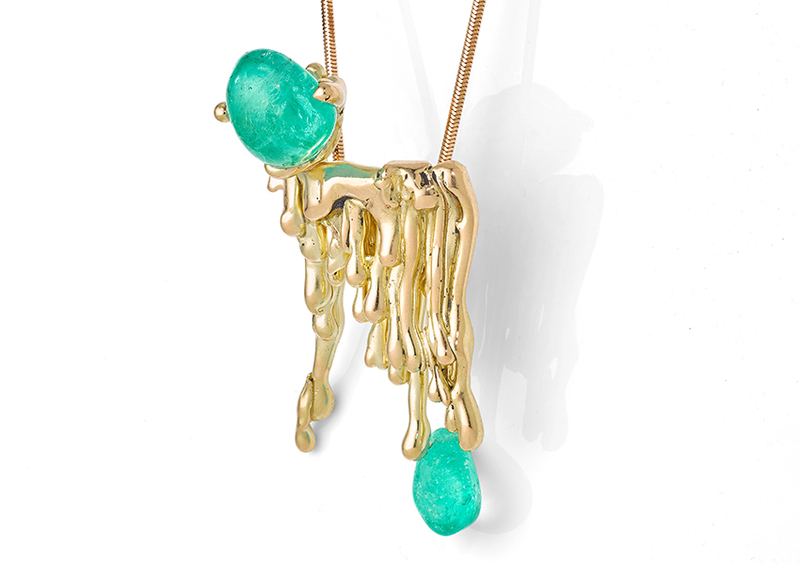 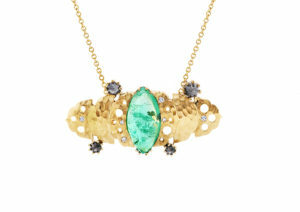 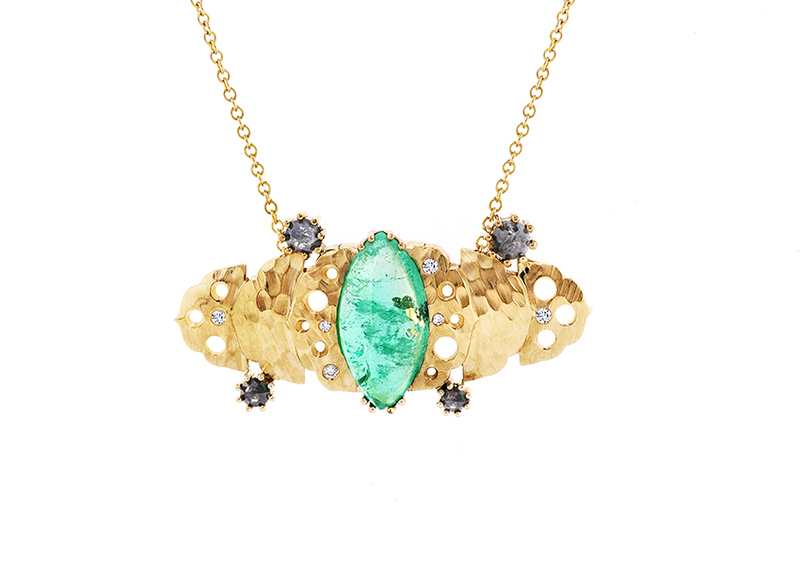 Molten Muzo Candelabra necklace in 18ct recycled yellow gold, set with 20.63 carats of Muzo emeralds. 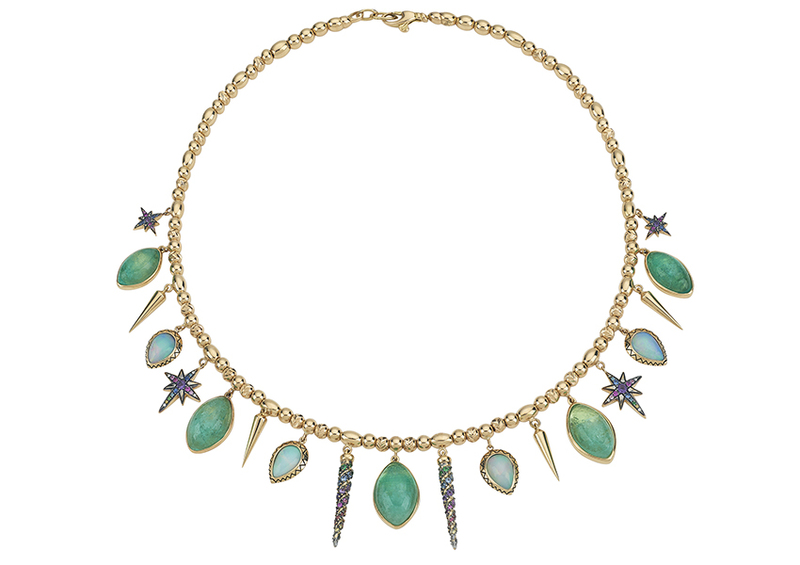 Muzo Narwhal necklace in 18ct yellow gold, set with 18 carats of Muzo emeralds, 0.09 carats of fancy diamonds, 0.15 carats of tsavorites, 0.32 carats of amethysts, 0.22 carats of blue sapphires, 0.21 carats of pink sapphires, 0.10 carats of orange sapphires, 26.41 carats of emeralds, and 4.68 carats of opals. 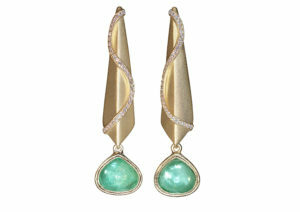 24ct and 18ct yellow gold earrings set with 24.10 carats of Muzo emeralds and 2.65 carats of diamonds. 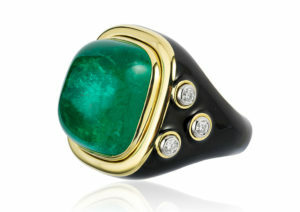 18ct yellow gold ring decorated with black enamel, and set with a 25 carat sugarloaf Muzo emerald and diamonds.